Slices of cabbage and radish can make Nabak kimchi by adding seasoning and sauce to the mixture. 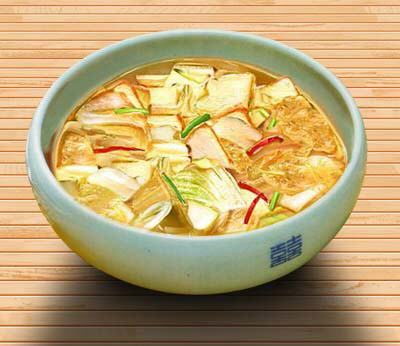 It has the clean taste of both Chinese Cabbage kimchi and Ggagduki. It is important to make it not too hot, nor too salty. No fish juice is added. Ground red chili is added not directly to it. In order to give a clean and uncoercing flavor, we wrap the ground chili with a small cloth bag, and wave it in the salted water to give a hint of red to the sauce. radish clean and wash. Slice after cutting into 3cm (1 1/5 inch) cubes. cabbage remove the sturdy outer leaves. Cut into pieces the same size as radish. salting scatter salt to the cabbage and radish mixture and let sit for 30 minutes. scallion, dropwort clean and wash. Cut into 3cm pieces. Rinse the salted cabbage and radish. Mix with young scallion, strips of red chili, garlic and ginger. Put in a pot. Add 1/2 cup of salt to 20 cups of water. Wrap ground red chili in a cotton cloth bag and wave gently in the salt water. Take out the bag when the water turns red to make the sauce. Pour the sauce in the pot and ferment. Dropwort is added when the mixture in the pot is almost fermented. When you want to speed up the process, boil and cool the sauce or add 2 spoons of sugar to the mixture.